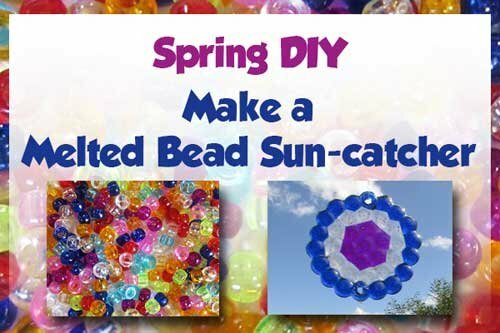 DIY Tutorial: Sun Catcher from melted beads. 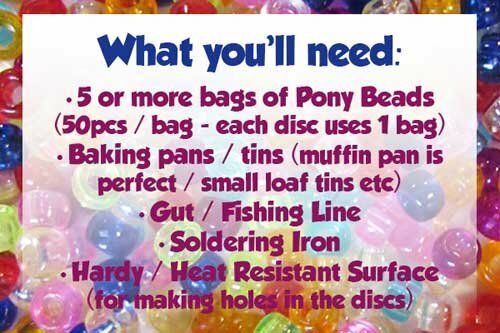 5 x packs of oval beads (x 50/ bag). Each disc uses about 50 beads. 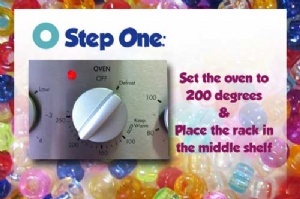 Set the oven to 200 degrees Celcius. You will be using the middle level shelf. Make sure your muffin pan / baking dishes are clean as any residue will melt with the plastic and become part of your design. 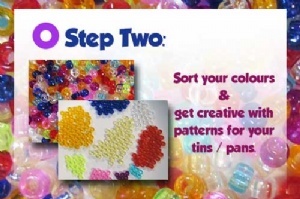 Get creative with your beads and spend some time planning out your colour combinations and patterns. Sorting your colours is quite helpful. For best results use simple geometric patterns - like concentric circles as these work really well. Once you are happy with your designs and colours, place a layer of pony beads into each of the muffin pan cups/ tins you have chosen. 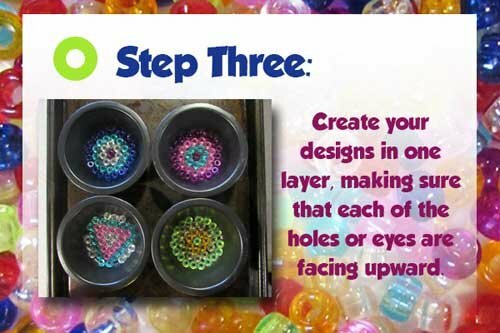 Make sure that all your beads are lying down with the holes / 'eyes' facing upwards. 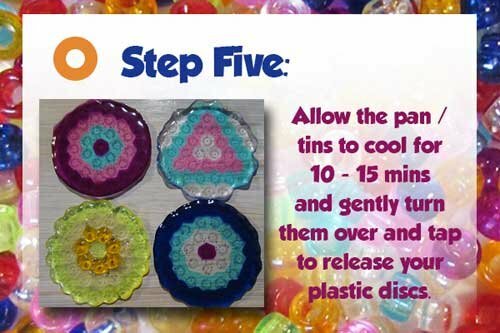 This is important as these 'eyes' will become air bubbles when the plastic starts to melt and this will help the air bubbles escape. 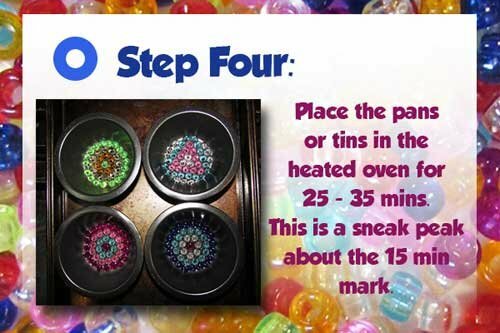 When the oven is at the desired temperature, place the muffin tray in the middle level tray within the oven and allow the beads to melt for around 25 - 35 minutes. At around 15 minutes you will see them already starting to melt and become very shiny. Remove the muffin pan, and allow it to stand and cool for 5 - 10 minutes. 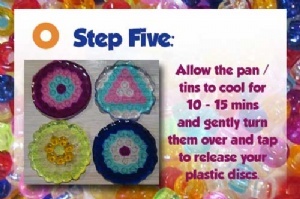 Once the pans/tins have cooled, you can turn the pan over and gently tap the now plastic discs out from the pans cups. The discs should come out of the pan quite easily with a tap to the underside or two. Next, plan out your configuration ie. 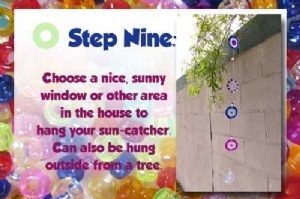 How you would like the sun catcher to hang. 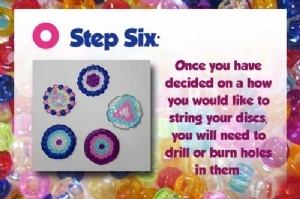 This will determine how many holes and where to place them when working with the soldering iron or drill. Please exercise caution, and adult supervision where applicable. 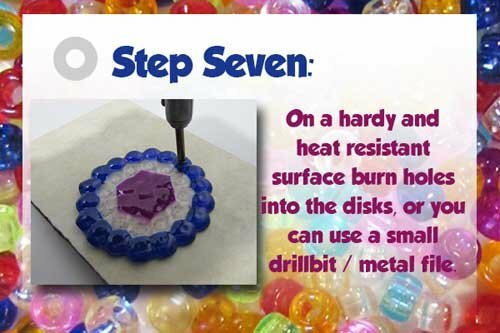 a tile), heat the soldering iron and begin to push the nose of the soldering irons rod into the plastic disks to create holes in the plastic. It works really quickly. A drill will work well, and a safer option is to use a thin metal file. Although the latter will take longer and require a lot more effort! 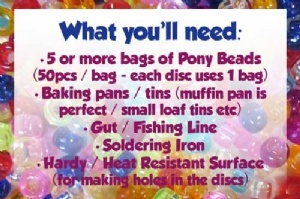 If any, neaten up rough edges / remove bits of plastic covering your newly made holes with sand paper / a file. 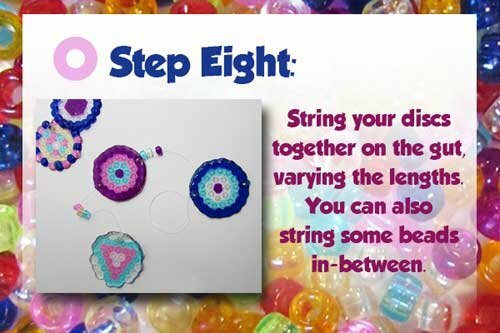 String your Sun Catcher together using the fishing gut. Use varying lengths and accenting your threading with extra beads between discs. Hang your sun catcher in a sunny window for best results, or from a tree outside. Another idea for those interested in jewellery making - if you have moulds that are small enough, you could turn these into some pendants and / or earrings! This item has 1002 views.